Friday afternoon is Forest School time for Jasmine and Thomas. 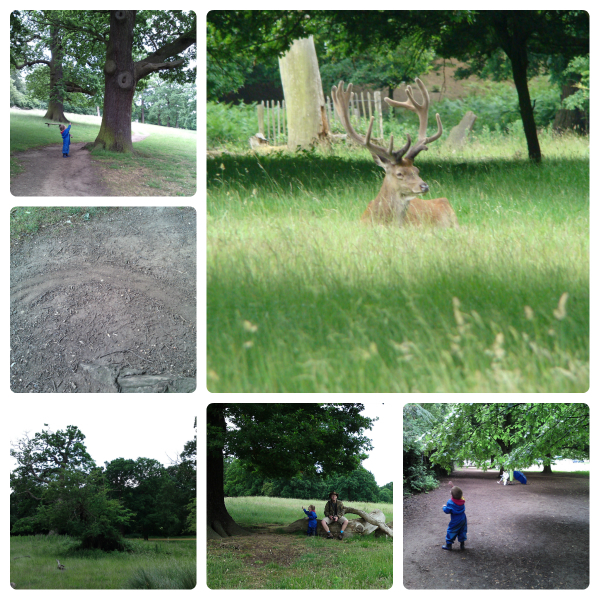 Forest School is in Ham Common Woods so Ben and I go to Richmond Park while we are twin-less. Sometimes we go into Pembroke Lodge and enjoy a drink and a cake, but most of the time we go exploring. 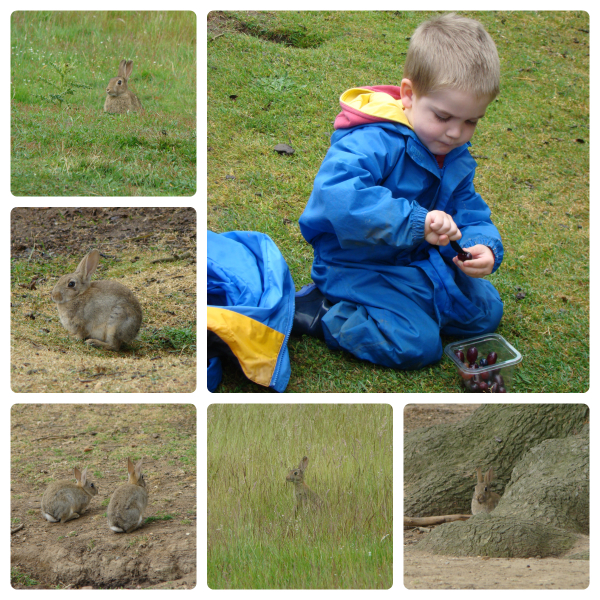 Two weeks ago we found a huge rabbit warren under an oak tree and now Ben asks to go and see the rabbits every week! Today was extra special for Ben because Gordon came with us as well, and Ben does love his daddy! He was super excited to show daddy where the rabbits live and where we sit and watch them! Once we’d eaten snacks, watched the rabbits and fed a crow we started walking back up the hill. 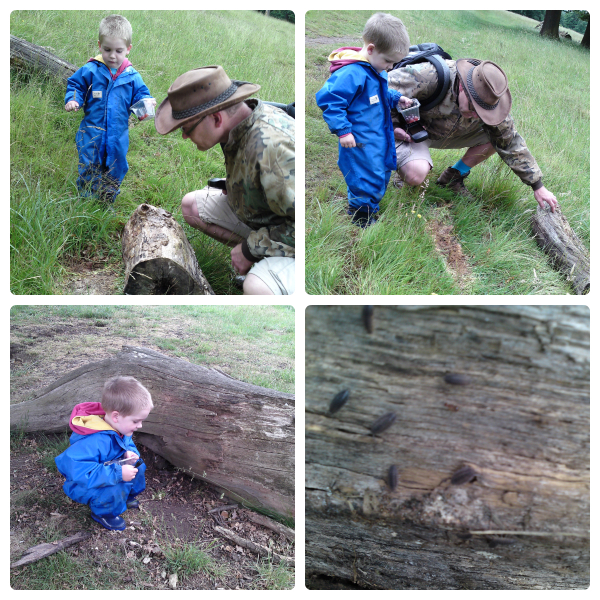 Ben wanted to do some bug hunting under logs so we walked from tree stump to log, carefully lifting them up to see what we could find. We only found red ants, woodlice, an earwig and a couple of ground beetles today. But while Ben and Gordon were busy studying red ants I saw a flash of colour dart into some long grass. I didn’t get a very good look at it but was sure it was a bird and my first thought was a woodpecker or maybe a jay. As I watched I saw it move again so we decided to walk towards it and see if we could get a better look, but as we approached nothing moved so I started to think whatever it was had gone whilst I blinked! But then we saw it fly up and away into a tree. A green woodpecker! I was very excited! We watched it for a while with the binoculars but it was so well camouflaged in the tree it was difficult to spot when it moved. It was almost time to go back to the car to collect Jasmine and Thomas but there was just one thing left to see. I had mentioned to Gordon, only an hour earlier, how I had never seen deer in the part of the park we were in. Well, of course that meant that today we saw three, sitting really close to the steps we walk down! Typical!